Gina Meyers, mastermind behind Redwood City's Lovejoy's Tea Room. 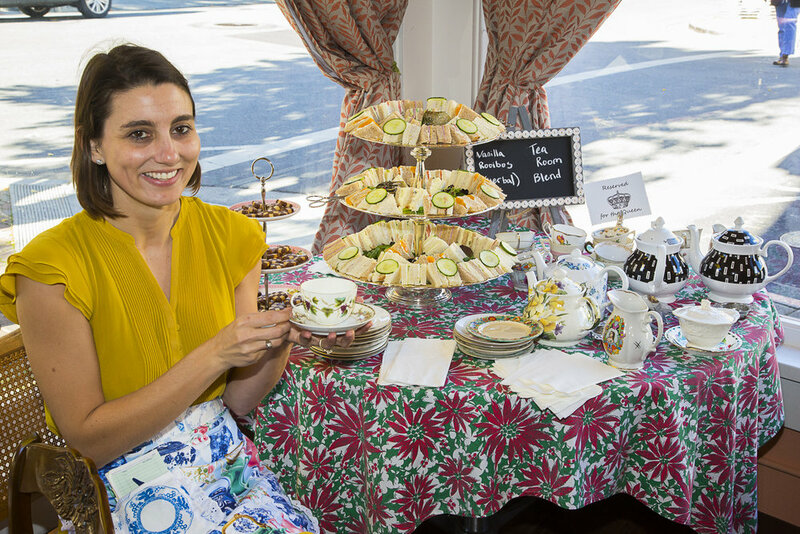 Anglophiles and tea lovers rejoice: a proper English tea room is back on the mid-peninsula, making Lovejoy’s Tea Room the newest addition to Redwood City’s Main Street restaurant parade. Cue up “God Save the Queen,” because the procession of crumpets dotted with lemon curd, delicate tea sandwiches served on tiered platters, and bottomless pots of Yorkshire Gold has begun. If the name “Lovejoy” sounds familiar, it is for good reason - possibly two. The first is that Lovejoy’s Tea Room was established and enjoys great popularity in San Francisco. “Lovejoy” might also ring a bell to those familiar with the British novels turned BBC series by the same name. The mystery-solving antiques dealer known as Lovejoy served as inspiration for the tea shops’ name. Gina Meyers, the owner of the nascent location, explained that the shop is not the result of a franchise, but of a “friendly agreement” between herself and the tea shop founders. She also shared how the tea room’s homey and eclectic ambiance and hearty menu contradict misconceptions about English tea, namely that fine china and delicate sandwiches relegates “going for tea” to stuffy, dainty ladies with mere whispers of appetites. “I tell people, I dare you to get through a Queen’s Tea without being stuffed,” Meyers chuckled. As one of the heartiest collections on the menu, the Queen’s Tea is an almost nonstop parade of tea sandwiches, crumpets, scones, salads, and fruit. As for the tea sandwiches, the options are plentiful; ranging from a simple cream cheese to the sharp and traditional Branston Pickle Chutney and cheddar. The abundance is then rounded out with a grand finale of beautiful petit fours that are almost too pretty to eat. Almost. If the hearty selection of dainty fare doesn’t whet the appetite, or perhaps time does not allow for a leisurely procession of food, there is “pub fare” to choose from too - savory sausage rolls, Shepherd’s Pies, and quiche just to name a few. Add into the mix the bottomless pots of tea (of which the selection is from Britain’s pride, Taylors of Harrogate), and the issue quickly becomes not whether there will be enough to eat, but of how to choose, and where to fit it all. The tea shop’s atmosphere is as much a part of the experience as the food. Described by Meyers as “funky and unpretentious,” this is the tea room where cups and saucers are not bound to their patterned mate, and almost every detail, from tablecloth to wall hangings, follows mix-and-match suit. Trimmed in a soft purple, the shop displays a smattering of antiques and trinkets one might see in the parlor of a fine lady’s home, or the cozy living room of a favorite granny. A poster of a young Queen Elizabeth, with a soft yet imposing Mona Lisa stare, casts a watchful eye on tea-sipping patrons. “I would say that I have been collecting items for the shop for about nine months,” Meyers said, “but really, I have been collecting things for years.” Her eye and dedication paid off. The strategic eclecticism emits a warm and cozy feel; an invitation to relax, turn off the cell phone, and stay awhile. Roast the chicken (or cheat and buy it roasted). Chop it up. Mix all of the other ingredients in a bowl. Taste and adjust as needed. Dump the chicken in, mix it all together. Taste and adjust again, if needed. Spread onto sandwich bread, cut into fours. Plate, serve, enjoy!